To everything, turn, turn, turn as THE BYRDS once sang and while that's hardly a metal tune, the sentiment rings the same in light of the reformation of metal legends SANCTUARY. As most know, vocalist Warrel Dane and bassist Jim Sheppard bailed in the midst of a label-proposed stylistic change to grunge, forming power metal favorites NEVERMORE. The latter being put on the shelf indefinitely a few years ago with the departure of guitar ace Jeff Loomis, Dane and Sheppard now return with Lenny Rutledge and Dave Budbill along with replacement guitarist Brad Hull to kick SANCTUARY back into action. It being twenty-five years since SANCTUARY's last album, "Into the Mirror Black", initial speculation as to what "The Year the Sun Died" would bring has played out favorably to many listeners. The thing to realize is "The Year the Sun Died" is often closer to a NEVERMORE album than the SANCTUARY unit which recorded "Into the Mirror Black" and the thrashy "Refuge Denied" beforehand. The absence of Jeff Loomis from both NEVERMORE and SANCTUARY is certainly telling on this album, despite a game effort from Lenny Rutledge and Brad Hull. Fans, however, can take heart that "The Year the Sun Died" is, at times, a pretty cool ride — being what it is. Opening number "Arise and Purify" acts as a testing ground to which Warrel Dane melds a tough, low octave with a handful of rising altos while the song plods along at mid-tempo with backend double hammers from Dave Budbill. Ironically, there's a dragged-down ALICE IN CHAINS grunge feel to the choruses of "Arise and Purify" even though the verses are pushed out as pure metal. Strange cosmos. Afterwards, "Let the Serpent Follow Me" plays a tricky beat pattern that feels like Dave Budbill is going to mosh away, yet he pulls back on the four count each time until the closing stanzas. Instead, Budbill's rolls receive the heavier rushes while the choruses, as they do on "Arise and Purify", scale back in tempo. Lenny Rutledge and Brad Hull spin some evil riffs and cavorting solos on "Let the Serpent Follow Me", dirtying up even more on "Exitium (Anthem of the Living)". Warrel Dane changes key just enough on the plodding seethe of "Exitium" to extend and elevate his notes on the choruses while tugging zombie monotones and sinister snipes out of himself atop the bridges. It's when "Question Existence Fading" arrives when "The Year the Sun Died" feels like NEVERMORE and Warrel Dane minces high and low pitches amongst the poked and punched drive of the track. Jim Sheppard leads the guitar section right into a mire, yet the solos rise and sparkle no matter how inherently ugly the tone of "Question Existence Fading" gets. The superb but gloomy ballad "I Am Low" follows, giving Dane a despondent-yet-engaging canvas to whisper and swill against. The piston-popping "Frozen" is speckled with thrash bursts and exceptional solos to which Warrel Dane decorates with his own palettes, swelling all over the slow choruses. Much of "Frozen" is delivered instrumentally and the band leaves an impressive wake which is sadly shirked off by the sometimes cool, sometimes shaky dirge ditty "One Final Day (Sworn to Believe)" and the so-so power pumper "The World is Wired", the latter of which meanders for too long. Even "The Dying Age" goes flat in a hurry, which leaves cause for alarm this album is about to shank the second half. The moody but well-executed instrumental "Ad Vitam Aeternam" is precisely what's needed at this point on "The Year the Sun Died", seguing into the sulky and sluggish title track. Fortunately, the riffs thicken up, the guitar solos weep and Warrel Dane pulls out some of his best pipes to give the song's strain some loft. 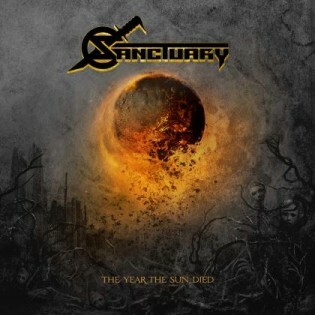 SANCTUARY wraps this album with a blasé cover of THE DOORS' "Waiting for the Sun", leaving the album on a whimper and a question mark as it tries to be fashionably goth. Thus "The Year the Sun Died" is front loaded and not wholly up to the hype. After a quarter century, it's nice to see four-fifths of a band come together and settle their differences, yet "The Year the Sun Died" seems even less like SANCTUARY than the foiled intentions of a misguided A&R rep from the early Nineties.